Give me an “M”! Give me an “E”! Give me an . . . okay, the word is “menswear,” and it’s way too long to spell out in a cheer. But I’m so excited about the menswear in this issue—the Widener Pullover especially. 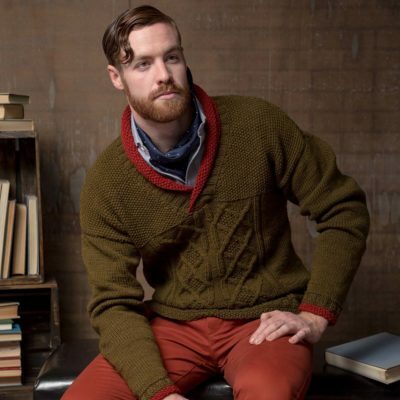 It’s an attractive shawl-collar pullover that blends classic gansey elements with cables and texture and features a modernizing (and optional) pop of contrasting color at the collar and cuffs. You work this sweater from the bottom up in pieces and change needle sizes to accommodate gauge variations in the stitch patterns, making this top a fun, challenging summer project to tackle. I definitely prefer to work projects in pieces when knitting in the summer to avoid holding a lot of fabric in my lap. As for styling, this professorial pullover is at home paired with a button-down shirt and dress pants, but you could also pair it with jeans for a more casual look. 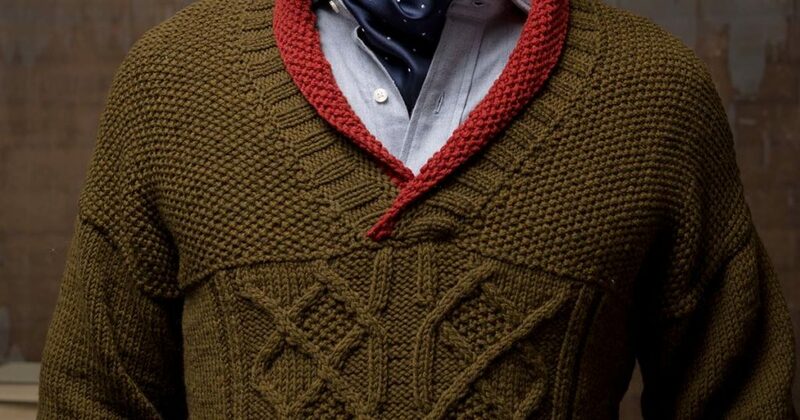 And if you (or the recipient) are a tad color-shy, you can knit the shawl collar and sleeves in the same color as the rest of the sweater. Do you know anyone who would rock the menswear projects in this issue? See them all with the Interweave Knits Fall 2018 lookbook. FINISHED SIZE 33½ (37, 41½, 45, 49½, 53, 57½, 61)” chest circumference. Pullover shown measures 41½”; modeled with 3″ of positive ease. YARN Brown Sheep Company Nature Spun Worsted (100% wool; 245 yd [224 m]/3½ oz [100 g]): #209 wood moss (green; MC), 6 (7, 7, 8, 8, 9, 10, 10) skeins; #101 burnt sienna (red; CC), 1 skein. NEEDLES Sizes 6 (4 mm) and 7 (4.5 mm): 32″ circular (cir). Adjust needle size if necessary to obtain the correct gauge. GAUGE 18 sts and 26 rows = 4″ in St st on larger needle; 18 sts and 32 rows = 4″ in Seed st on smaller needle; 58 sts of Cable chart = 10½” wide. 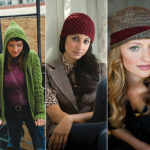 Top 5 Interweave Knitting Patterns of All Time!